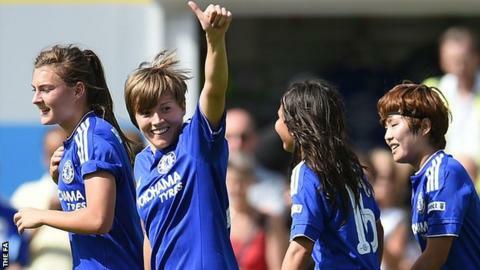 Fran Kirby scored on her debut to help send Chelsea Ladies top of WSL 1 with a thumping win over Birmingham City. Chelsea had Gemma Davison sent off for a second caution for diving, soon after Eniola Aluko's close-range opener. But Gilly Flaherty's strike from a corner in first-half injury-time deflated the visitors. An Aluko penalty and Kirby's emphatic finish ensured the Women's FA Cup winners got their Super League title challenge back on track. Aluko, the player of the match in the Wembley win over Notts County eight days earlier, confidently placed home her spot-kick after Aoife Mannion's handball and the England international was almost immediately replaced by fellow Lionesses forward Kirby. Kirby, who moved to Chelsea from Reading for a reported British women's record transfer fee, looked sharp and bright on her Chelsea debut and made it 4-0 when she ran through and smashed the ball past goalkeeper Rebecca Spencer. It rounded off a stylish display for the Blues, who had lost their previous two league matches. The home win at sunny Staines FC only briefly looked in doubt when Davison was dismissed by referee Paul Forrester for tumbling in the box with the score at 1-0. By that stage, Aluko's searing pace had set the tone for a dominant display. Only a fine fingertip save denied Aluko after a lovely Katie Chapman pass and she then teed up Davison who fired over from close range. Lacklustre Birmingham barely threatened and could only muster a couple of long-range strikes, the best of which saw a fabulous curling shot by Jo Potter slide just wide. The deserved home breakthrough finally came when Ji So-Yun led an incisive counter-attack and found Drew Spence, whose shot was turned in on the rebound by Aluko. After Davison saw red, Chelsea took a decisive lead into the break when some terrible marking allowed Flaherty plenty of space to turn in Ji's corner. Aluko and Kirby's second-half goals ensured Chelsea topped the table prior to Arsenal's meeting with Manchester City on Sunday evening. Chelsea Ladies: Lindahl, Blundell, Fahey, Flaherty, Borges, Bright, Chapman, Spence (Coombs 71), Davison, Aluko (Kirby 58), Ji (Banusic 74). Substitutes not used: Hourihan, Meiwald, Primus. Birmingham City Ladies: Spencer, Sargent (Ayisi 45), Mannion, Harrop, Lawley, Winsall, Allen, Carney (Wellings 50), Potter, Linnett. Substitutes not used: Baggeley, Edwards, Westwood, Torkildsen, Haines.